A cultivar of Prunus avium L. ‘Fruit usually growing singly, pretty large, heart-shaped, much resembling the Bigarreau, but much earlier. Stalk two inches and a quarter long, slender. Skin pale waxy yellow on the shaded side, mottled and dashed with rich red next the sun. Flesh firm, but less so than the Bigarreau; very sweet and rich. Ripe the beginning and middle of July, about the time of the May Duke, or soon after.’ [George Lindley – Orchard guide p.151/1831]. ‘This Cherry was sent to the Horticultural Society in July last year by Mr. Andrew Knight, by whom it was first raised, at Elton [in 1806], having sprang from a seed of the Bigarreau and the pollen of the White Hart [sic]. It much resembles the latter variety in the great length of its fruit stalk, and the delicacy and juiciness of its pulp; and it was very much approved by the Committee of the Horticultural Society. The original tree, which produced the fruit from which the annexed plate was taken, was only six years old, and had been transplanted in the preceding Autumn: there is therefore much reason to believe, that its future produce will be superior, both in richness and size, to those from which the present plate was taken. The tree was stated by Mr. Knight to be of very vigorous growth; and he expressed his opinion, that it would prove very productive; it having borne a good crop, where several other trees, under similar external circumstances, had not afforded a single cherry. It ripened its fruit upon a West wall; but it had previously been a standard.’ [PL vol.1, pl.7/1818]. 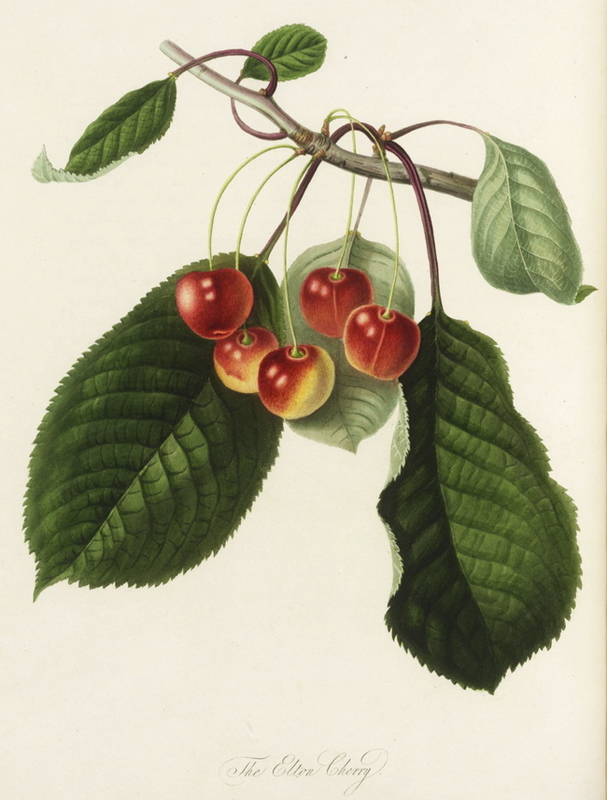 Listed in an Addendum to the 1857 catalogue only [Cherry no.17/1857].